Added two new ways to open URLs in Twitterrific, a new URL scheme that's perfect for automation, and fixed some annoying bugs. macOS app severely flawed, needs timeline window update! 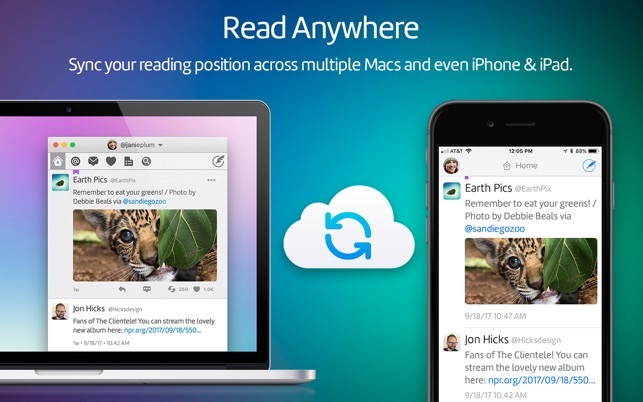 Today I took the plunge and bought into the twitterrific ecosystem buying both the ad-free version of the iOS app and the macOS app. While the iOS app is flawless having every feature you could want (auto night mode, cross-platform timeline sync, etc) the macOS version 5.3.3 lacks in performace, streamline use, and design. Twitterrific, I would like a refund or corresponding bug fixes because this version is not worth any amount of money. Prior I used Tweetdeck and due to the lack of iOS app, I had to switch. The two biggest overall issues is the noticeable lag when opening and dragging a timeline window on my fully spec'd MacBook Pro 2015. It’s jitters beyond usability. The second, why does the app not combine the timelines into ONE window? Instead it opens a new app window and the user is unable to join the timeline windows into one. This voids of any cohesion within the workflow. The new timeline window opens up tiny and requires the user to resize it. 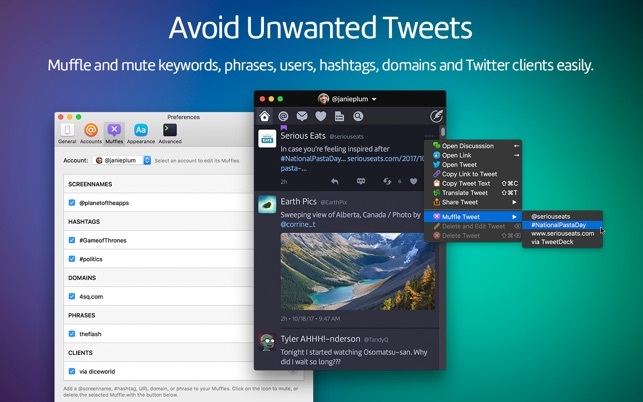 Please refer to the design of Tweetdeck or Tweetbot and update where you have a single fullscreen window with a timeline strip for home, notifications, mentions, messages, likes, lists, and search. Tweetdeck’s UX design utilizes the fullscreen capability of the desktop while maximizing workflow. While twitterrific gets most right, the macOS app needs urgent updating or I would like a refund to buy tweetbot alternatively. New to Twitterrific and really enjoying it! 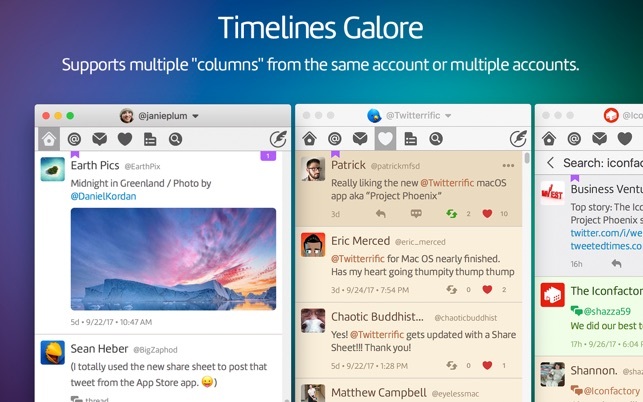 I’m mostly new to Twitterrific, having only used the iOS app years ago. Recently I decided to give both the Mac and iOS apps a try after hearing about how great they are on a popular tech podcast I listen to. I have to say, I’m very impressed and delighted so far. Timeline sycning is great, the compose experience is nice and clean, and it’s easy to keep tabs on conversations. I also really love having the ability to pull Tweets out into their own window, it makes it easy to follow a conversation or a specific user’s timeline. I also love being able to command+O to view Tweets in a mini browser, which is handy for viewing details of a Tweet (like who liked or Retweeted something), as Twitter’s API makes it a real pain for Twitterrific to actually implement that in-app. There are tons of other useful keyboard shortcuts as well, which I discovered after reading their help docs. 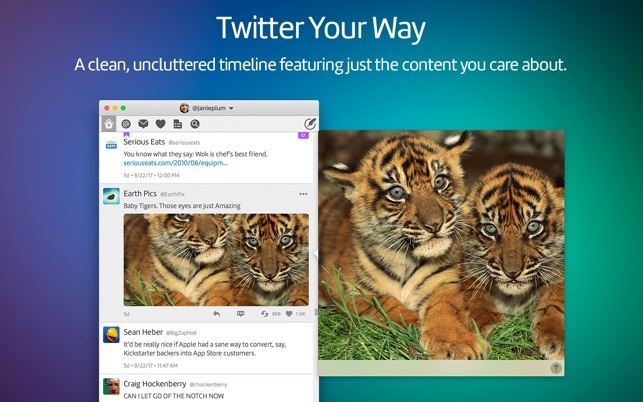 Anyway, yay, love it and will be switching to it as my primary Twitter client on Mac (and on iOS too). So glad you're enjoying the app and thank you for taking the time to leave such wonderful feedback. Remember, if you have questions or problems to check our Twitterrific knowledge base or just ask us on twitter at @twitterrific. Thanks and enjoy! I’d give this a 1 or 2 star rating, but I couldn’t be that mean. I’m probably one of the very few who enjoyed using the official client with the exception of one bug that wasn’t even that bad. I would still use that client if it worked. All comparisons below are Twitteriffic Vs the former official client. I don’t want to open video in a browser window, but I can’t see a setting to change this. I can see how a pop out would be better when opening a tweet, so far, I don’t prefer it and I see no way to change it. I paid for it, and I’m looking for something to replace it. 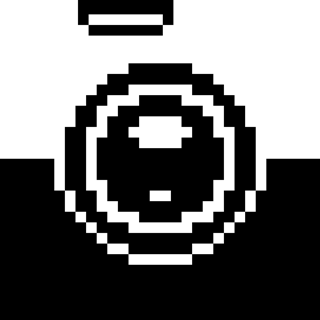 I don’t think I have encountered any bugs yet, unless the icon is supposed to change with new tweets. You can open multiple windows and set them to difference accounts to see more than one at the same time. Videos only open in browser windows when they are not hosted on Twitter.com such as YouTube and Vimeo. All other videos open in popovers. 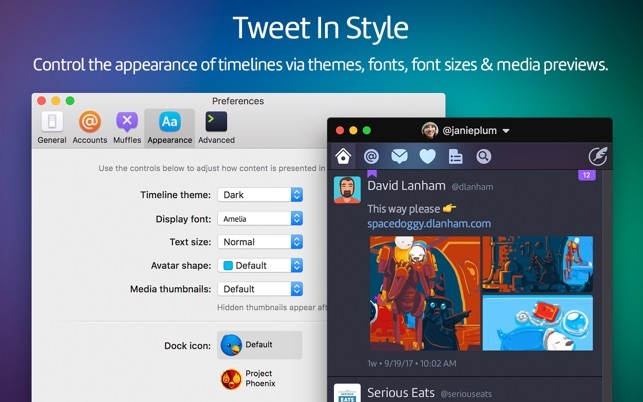 Popovers are flexible ways to view tweets that help you navigate through conversations and user profiles without cluttering your desktop up with additional windows. Simply click the action menu ... and Copy URL to tweet to send that to another person easily. We don't notify you of new tweets, if we did you'd be being notified all the time and it'd be annoying. We notify you when someone mentions or DM's you instead. Hope this helps!